A full slate of the MLB playoffs is just about to get underway, with four games going all afternoon and well into the evening. Up first is Texas-Tampa Bay in Game 4 of the ALDS, with Matt Harrison going against Jeremy Hellickson. 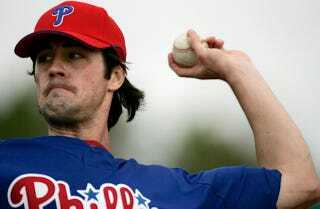 At 5 (EDT), Philly's Cole Hamels takes on St. Louis' Jaime Garcia at Busch in Game 3 of the NLDS. Texas leads Tampa 2-1 won the game and the series and can advance with a win today. Philly and St. Louis are tied. Both games are on TBS, plus local networks, though our viewing guide is always a handy resource if you need it. Go right ahead and talk it over in the comments.